For me courage is to struggle with patience and stand strong to overcome obstacles in all circumstances. My name is Chhin Thera, my house is in Kauk Rovieng village, Kampong Cham province, Cambodia. My family has five members including my mother and father. My mother is a food seller to the shoe factory workers and my father is a palm tree climber who collects palm juice and makes palm sugar for selling in the village. In 2012 I had a lot of difficulties. My parents couldn’t afford to buy school supplies for me and so my mother asked me to harvest wild vegetables like morning glory from the ponds for selling in the village. I used the money from selling vegetable to buy school supplies. Last year I was in the 7th grade. I was very happy because I was chosen by the school principal to receive a scholarship offered by the Ministry of Education for poor students. I am very happy that this program just started last year. It is very helpful for me. I always spend that money to buy school suppliers and uniforms. This makes me study harder. During the summer school vacation some of my classmates went to study English in the evening, which is free for all kids in the villages. That English class is located more than one kilometer from my house. I wanted to go learn English too but I have no bike like others students, so I had to walk to the English class every evening. My mother felt such pity for me that she repaired an old broken bike left for a long time that belonged to my grandfather, so that I could ride to the English class. This school year 2013, I study in the 8th grade. My mother wanted me to stop studying because she needs me to look after my little brother while she is busy with selling food. Because I don’t want to stop studying, I tried to persuade my mother again and again to allow me to continue to attend school. Finally she agreed with me, but she asked me to take my little brother every time I go to school. I am happy to follow her advice. It is not easy to go to school with my brother along with me, but I do it. Because I want to keep studying, I have to endure with those difficulties. I am very happy that I still can go to school. If I had no courage to ask my mother to let me continue studying, I would be disappointed about not going to school. What is courage? Courage means to struggle with patience and pain and dare to face problems. My name is Mai Sotira. I am in grade 8. My house is in Kauk Rovieng village, Kampong Cham province, Cambodia. I have five brothers and one sister. I am the fifth son in the family. My parents are poor rice farmers. I had a very hard time when I was in the primary school because the parents who are poor couldn’t afford school supplies, especially notebooks. Because of that I went to the rice field to look for the string rice. It is the food that is left in all the rice fields after the farmers harvest the fields. I sold it for money. I also looked after the neighboring cows for 12 cents per day. My parents work very hard. When I have free time I always help them to do the housework. I also take the cows to feed in a field far from my house, coming back when the sun sets. My brothers and I go fishing in the fields far from the village and catch fish, frogs, snails, and crabs for cooking, in order to save some money for my parents. When I was in the third grade my brother fell from a palm tree. My parents spent all the money from selling palm juice and vegetables to pay the hospital to heal him. I stopped studying for one year in order to look after him. 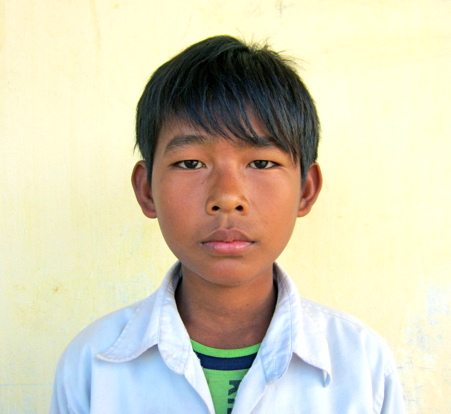 Now he has recovered, but he has mental problems, which caused him to stop going to school. When I resumed school in the fourth grade, my father also became sick. When I entered the sixth grade, my third brother had a traffic accident. My mother and I had spent all the money for curing my father and brother who fell from the palm tree, so at that time we had no money left for curing my brother from the traffic accident. My mother had to borrow money from the neighboring villagers. My mother worked very hard to get money to pay for the medicines for my brother and my father, and also to support my brothers and me so we could go to school. My father has now left home and didn’t tell my mother where he went, leaving my mother to take care of all the children. It is a big burden on her. She has a lot of courage for the family and she never gives up. 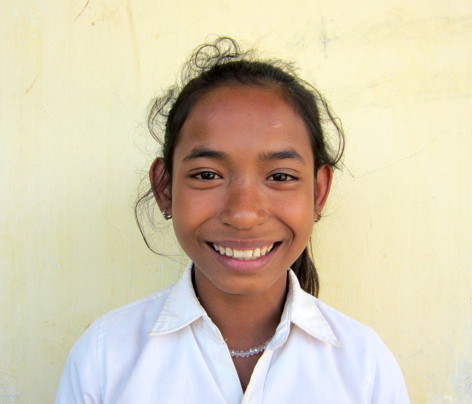 Because all of my mother’s courage enables me to become an 8th grade student now, when I graduate from school I want to be a teacher in my village.